I’ve been thinking often, for the past 8 months, on what being a gentleman requires and means. Oddly, as a men’s blog we’ve yet to write specifically on being a gentleman. As the old year just passed, and we’re two weeks into the new one, many guys have big goals and focus points on what they want to change. Many of these thoughts on being a gentleman may seem redundant or rudimentary to you. Many of these thoughts are inspired by simple observation of what many men are–and are not–doing. Being a gentleman is more than distinguished style or elegant talk. It’s the best mix of your character, treating others well, and presenting yourself as a man others want to follow. A big shout-out to Effortless Gent for much of this inspiration on being a gentleman. Ladies and Gents, if you’ve got more thoughts to add to The Rules to Always Being a Gentleman, please leave them in the comments below, and check out Part II of the Gentleman Rules here. It may seem like it, so you’ll need to revive it. This not only applies to the lady in your life, but other people you meet as well. Going out of your way to treat people well is important. Carrying yourself in an accommodating a “serving” way—is rare, valuable, and will make you stand out. Here’s what you can do—open the door for people. Holding the door open for an old lady or a young man still makes you stand out as a gentleman. Go out of your way to be considerate of people. Being a gentleman is more than cleaning up the cursing, but sounding intelligent without coming off as arrogant. We each have our own unique style and personal vernacular. But improving and expanding your vocabulary will make you into a better communicator. The ability to paint elaborate pictures in your acquaintance’s minds is a sought after trait. Don’t go through life living only for today or tomorrow. Find an aim bigger than money. Seek out a purpose, and run hard after it. I find that people that I respect as gentlemen have something to live for. Whether or not you’re a social butterfly doesn’t mean you can’t improve. People that are extremely introverted sometimes need to take pause and read social cues. Am I stepping on anyones toes or making people feel left out? Do I move from one person/group to another so fast people think my substance is paper thin? If you’re of the more chill temperament, it doesn’t mean you can’t grow. My name, Todd, in Middle English (spoken about 1,000 years ago) means “the watcher”, “watchful one”, or the “fox”. I actually consider myself by nature a more reserved person. But by observing other’s social cues, I’ve been able to pick up on how to interact with a wide array of people. Most people upon first meeting me would think I’m pretty extroverted, whereas I’m pretty introverted to the core. People who are awkward or come off as rude have one core problem in my mind. And it’s not that they aren’t able to be cool people. It’s that they think of themselves and are absorbed in their own world so much they don’t listen and pay attention to people’s words and body language. Learning what people mean by more than what they say will help you go further in your friendships and professionally. A man who is slow to forgive is…well, less of a man. Be quick to show mercy. Give people grace for mistakes. Be understanding. Show compassion. Don’t have a heavy hand with your kids or other family members. People respect someone who knows what they want—and what they don’t. Saying “no” makes your “yes” mean so much more. If you haven’t learned to say “No”, you might be living as a Yes Man. Who wants to be that guy? Especially when you are so overcommitting yourself you’re known as a flake. If you find yourself saying “yes” to overextending yourself, it’s time to summon the will to say “no”. If you’re afraid of commitment, it’s time to take the dive and start giving more of yourself to people. Whether that’s saying “yes” to helping a friend move, just getting out more, spending more time with friends, or gaining different experiences, it might be time to step out into the wild a little more. We admire people who exude confidence and aren’t afraid to reach out and connect with people. Saying “hello” to a stranger you rub shoulders with on the train, in an office, or at the grocery store is a great way to increase your social skills—and meet new people. Have you ever wanted to introduce yourself to a cute girl in the most random of places? If you’re not in the rhythm of shooting from the hip and building rapport with random strangers, it’s gonna be hard to summon that off-the-cuff confidence to get talkative with a hot stranger. Practice saying “hello” and showing yourself friendly. You’ll be surprised by some of the cool people you’ll meet along the way. 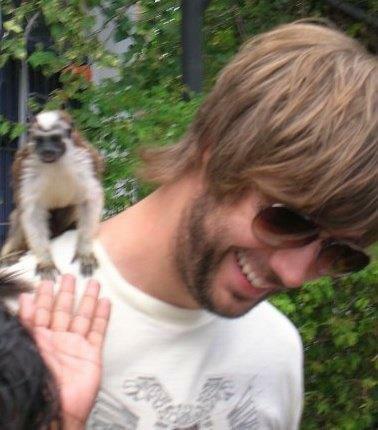 Just chilling with monkeys in Panama. Expanding your experiences and where you’ve been gives you great stories as you grow being a gentleman. Growing more cultured widens you’re understanding of the world–and others–and helps you to be less assuming or quick to judge. And it’s always nice to tell people about that one time you jumped off a moving train in India (yep, true story). It is the era of disheveled elegance. It is not the era of mangy faces and unkept chest hair. Keep yourself scaped and groomed. Take the time to look clean, showered, and smelling good. This might seem redundant to some, but it’s always good to get a lady’s feedback on your cologne–and how much you’re caking it on. This is only the beginning on our path to being a gentleman. Improving yourself doesn’t happen overnight. As we’re already two weeks into the new year, have you decided on any areas you want to focus and improve on this year? It’s a great aim to look better, talk well, and dress sharper. But making yourself into a better man is more than just improving the physical details. It’s about cultivating your core. Find what you’re passionate about, and run after it. Find who you want to become, and chase it. Find out where in your character you’re deficient, and work on it. Let’s face our fears and grow into better men this year. Ladies and Gents, if you’ve got more thoughts to add to The Rules to Always Being a Gentleman, please leave them in the comments. 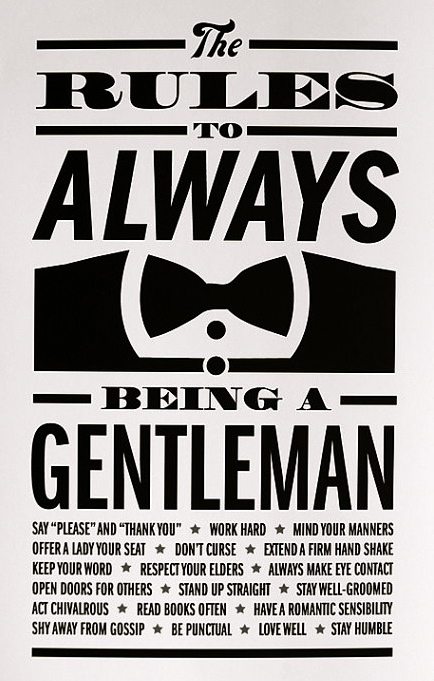 We’ve already taken some of them and put them in Part II of How To Be A Gentleman! One thing my parents did a really good job of when it came to raising me was they stressed manners and the way I talked to people. Whether it is women or just someone you meet on the street. I try and always treat them with respect and be easy going. That’s a great point–on having great manners. Anything examples of that behavior that would be good to include in the next post? Great post Todd! I’ve spoken to my younger brothers about this a bit lately and it seems to go in one ear and out the other sadly. I think often times being a gentlemen is viewed as being weak when I think it’s not that at all. I can vouch for chivalry not being dead…at least not as far as I am concerned. I’m curious at what time in a males life do they begin to admire honor and respect over rebellion and angst. Until that happens, a boy will never see the value in manhood and being a gentleman. I just found your website and I love it. These are great rules for gentlemen! Thank you for sharing and I look forward to part II. Thanks Dave! Great to hear from you. A good friend and I started the site, one b/c he is passionate about reaching out to men beyond the Christian context, and I simply wanted to test out if I could write on a consistent basis. It’s become a little bigger than we originally imagined! Holding doors open for people is a priority for me. When I go through doors, if I see someone approaching, I will always hold it open for them. I also seem to be fairly good at telling when people are upset. I actually wish I was less good at it, because I tend to be pretty empathetic and my heart just breaks when people around me are upset. It’s a great skill to be able to listen to people that are withdrawing because they are hurt. Those people, in the moment, likely feel overlooked and misunderstood. I’m sure to have you reach out to them is a big investment! One thing that I’ve found really works well is when you are talking to someone is to ask them questions about what they are interested in. So often when I meet new people whether it be at conferences or parties who often just want to talk about themselves or their situations. Instead, I ask them questions about what they like to do and I’ve found that this builds a lot more solid relationship with someone. That’s a great point that needs to be included! Putting others first–even in conversation is really important. I always liked the one where you should walk on the side of the sidewalk that is nearest the road. This is because you would be there to absorb the mess in case a horse carriage splashes in a puddle, or to throw your lady out of the way of coming danger from the road! I try to remember to do that one…. That, and NEVER swear at a woman. Good stuff! I think there’s the modern equivalent in us still standing nearest to the road, as well as walking first when crossing the street! Letting ladies in and out of the elevator first. I learned that by watching older men at work. Some of the younger guys haven’t picked up on that and you can sometimes see a subtle look of disapproval on the lady’s face. You can learn a lot from the older generation just by observing. That’s genius. Even more smart is watching the practices of the old gentlemen that have been at it for a while! Please don’t wear t-shirts or have bumper stickers with offensive slogans. I automatically think narrow minded redneck. Ha I saw your repost of this article on your site. I’ll make sure to let any guys I see know they shouldn’t wear “boobie” shirts. I was at the gym yesterday and saw a guy wearing a club promotion shirt that said “Party With Sluts.” I didn’t talk to him, but I felt a little bad that he has a sad enough life to try to help others be miserable. Ha! Thanks man. Glad we discovered each others sites! !